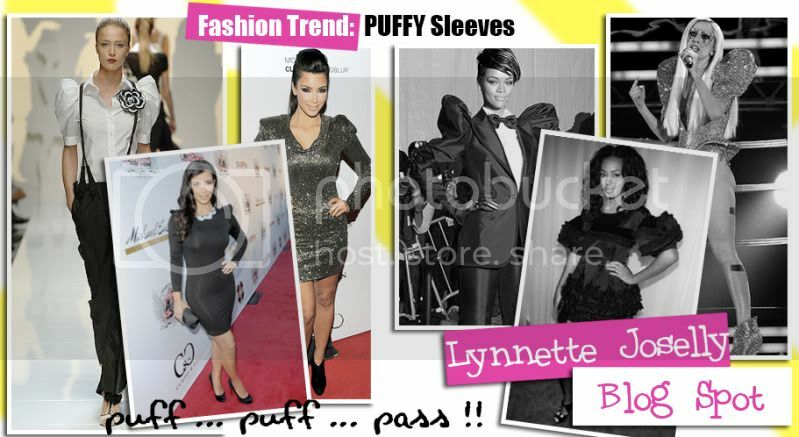 Lynnette Joselly: Fashion Trend: Puff... Puff... Pass! Fashion Trend: Puff... Puff... Pass! We Tell Em Puff, Puff Pass Wit Yo [Bleep]..Sorry that is the first song that came to mind when I thought of Puffy Sleeves. Any Who.. Here is another one of my fashion favorites. To me, puffy sleeves and padded sleeves are hott! The only thing is that you do not want to over do the puffy sleeves and look like a foot ball player walking down the mall in heels. I like the way the sleeves add a dramatic and sophisticated effect to the rest of the outfit. The popularity of the puffy sleeves will not diminish, so feel free to wear them next season as well.